A quick look at a rehearsal offers a hint of what’s coming: a man sits tuning a lute while two people juggle. Behind them, a contortionist is stretching to prepare for her bit. This entry was posted in admin on February 19, 2015 by Adele Burnett. This entry was posted in admin and tagged Christmas on Main Street, inlet christmas on December 18, 2014 by Adele Burnett. I recently sent out a plea to the area restaurants/bars asking them to consider supporting the SS Minnow, our local bus shuttle service. This entry was posted in admin and tagged Inlet, Letter to the editor, SS minow on November 27, 2014 by Adele Burnett. 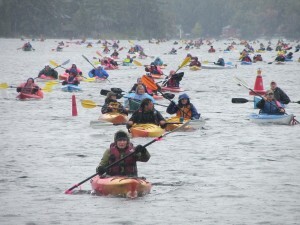 Over 3,000 people gathered in the little town of Inlet, NY on Saturday, September 13, 2014 and set out on Fourth Lake to break the record for the largest raft of canoes and kayaks at the One Square Mile of Hope event. This was our third attempt at this record. 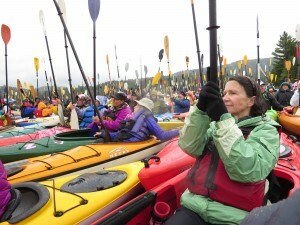 Our first two attempts were both successful: 1,104 boats in 2008 and 1,902 boats in 2011. Both events were also fundraisers for the fight against breast cancer, raising over $132,000 between the two events. This entry was posted in admin and tagged Inlet, one square mile of hope, records on October 2, 2014 by Adele Burnett. Despite the cool, damp weather, over 3,000 boats from 30 states, two Canadian Provinces, Thailand and Belgium converged on Fourth Lake in Inlet, NY on September 13 to shatter the Guinness World Record for the largest raft of canoes, kayaks and guide boats. This entry was posted in admin and tagged arrowhead park, Inlet, one square mile of hope on September 18, 2014 by Adele Burnett.